Long a major element of classical antiquity, the study of the laws of the ancient Romans has gained momentum in recent years as interdisciplinary work in legal studies has spread. Two resulting issues have arisen, on one hand concerning Roman laws as intellectual achievements and historical artefacts, and on the other about how we should consequently conceptualise Roman law. Drawn from a conference convened by the volume's editor at the American Academy in Rome, addressing these concerns and others, this volume showcases the expertise of participants from 11 European and two American universities. The Roman law of obligations-a subset of private law-is investigated in detail, together with its subordinate fields, contracts and delicts (torts). Participants elucidate the relationship between private law on one hand and Roman society and its economy on the other. Chapters also examine whether rules themselves reflect upper-class values and whether it is possible to speak of them as elements of an ideology. This volume includes contributions by Nikolaus Benke, Cosimo Cascione, Maria Floriana Cursi, Carla Masi Doria, Paul du Plessis, Roberto Fiori, Dennis Kehoe, Ernest Metzger, Federico Procchi, Michael Rainer, Salvo Randazzo, and Bernard Stolte, as well as opening and concluding chapters by editor Thomas McGinn. 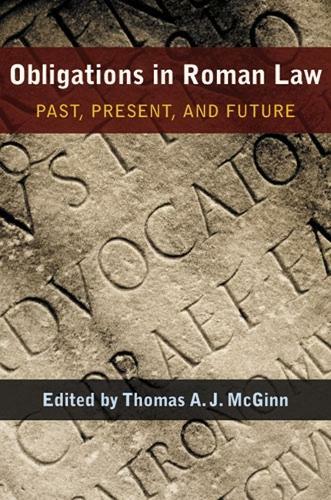 "McGinn assembled an all-star cast of contributors, who have now produced a dozen studies on obligation in Roman law. [They] have succeeded in assembling a volume that demonstrates to classicists and other students of antiquity the value--indeed the necessity --of learning to think like a lawyer when confronting one of the great monuments of Roman civilization, its law."